All types of agricultural tractors, machines, milking parlours, yards and stables need to be cleaned regularly. Stricter EU regulations mean that cleaning around the farm yard is getting more time consuming. Farmers today, need powerful high pressure cleaners to help them drastically reduce the cleaning times. 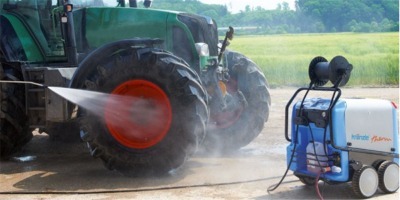 If you need to clean tractors, trailers, machines, vehicles, out-houses, milking parlors and other farm buildings regularly, the Kranzle range of high-pressure cleaners will get the job done. Liam Chawke Electrical can provide the right pressure cleaners that will produce great cleaning results with minimum expenditure of time and expense. For most farmers, agricultural contractors, landscaping contractors, general groundsmen, who need a pressure washer for more extensive use of up to 50 hours per month, we recommend the Kranzle Semi-Industrial models. Particularly for dairy farms but also for general farmyard cleaning tasks, tractor washing, machinery power washing, milking parlour hygiene and similar tasks, we recommend either the the Kranzle K1152TST or Kranzle K2160TST. Contact Liam Chawke Electrical & Water Pumps now at 069-64318 for more information or complete the form below to arrange a free power washer demonstration at your farm.